Calling all Motown movers, groovers & shakers. The Soda Factory is proud to announce Soda Got Soul//The Motown edition! We're drawing on the wealth of The Soda Factory’s in-house entertainment talent, musicians and special guests for over 4 hours of Motown soul and disco hits. Celebrating the most dancefloor-shakin’ era in musical history, get ready for some Dancin' In The Street as we deliver Motown hits from the likes of Stevie Wonder, The Jackson 5, MJ, Marvin Gaye, The Supremes, Diana Ross and many many more. We're excited to announce that KSTŃ - Kristian Attard & friends will be joining us for an extra special night of back to back hits. Book your area via hello@sodafactory.com.au. Walk-in's always welcome. Soda's Got Soul is our weekly night dedicated to everything soulful. Whether it's classic, neo, future, infused-with-blues, gently-stirred & sprinkled with a touch of jazz, or slow-cooked in funk—we don't care as long it goes down smooth. Comin’ in hot on the night are our Motown cocktails, so grab a guy, grab a girl, and Get Down On It. 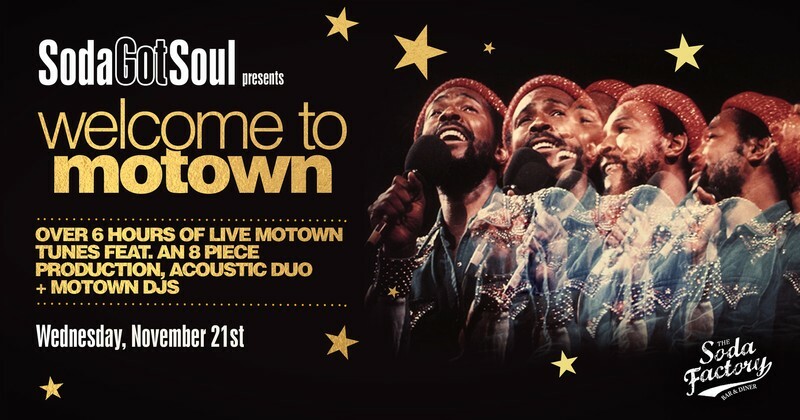 Like so many of the Motown hits, this one’s gonna be a classic!